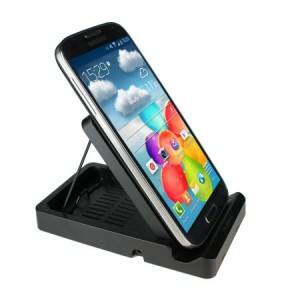 So you already own the Galaxy S 4, but want a wireless charging solution. Samsung still hasn’t released their version yet, but Mobile Fun in the UK has a solution for you that is available for pre-order now. The charging pad goes for $53.99 and is already available now. It will actually work out of the box with other Qi compatible phones such as the Nexus 4 and the DROID DNA. If you own a Galaxy S 4, you will need to also buy their wireless charging cover that will replace your current back battery cover. This goes for $37.99 and is available in both black and white. The good news is that these covers will work with any Qi charging pad, so if you already own one, you will only need to buy a cover. Unfortunately they aren’t in stock yet, but if you pre-order now, it should arrive at your doorstep in about 4 to 6 weeks. Hit the break for a short demo video and links to get your order in. dont wait for anyone just use existing cheap options and use with any phone and case just like i did with my samsung galaxy s4! see my videos for how http://www.youtube.com/watch?v=reYUIN_2nho and also watch this http://www.youtube.com/watch?v=Xz6KBH-eDFk and enjoy your wireless charging for all devices with wireless charging pins in the back. I have a tmoblie note 2. The t889. My wireless charging ports don’t have any power going to them. I wanted to know if I could get any support in fixing this problem.